When people slip, trip or fall, they often look around in bewilderment at the circumstances that possibly could have knocked them off balance. While it may sometimes seem that people trip on their own two feet, more often there is some real culprit that caused them to fall. So much depends on coefficiency of friction. The lower the friction, the greater the risk for a fall. “A slip occurs when someone steps on a surface and traction is lost between the bottom of the shoe or foot and the surface they are walking on,” says Steve Spencer, facilities specialist with State Farm Insurance, Bloomington, Illinois. Often, a cleaning substance can be the cause of slips and falls, particularly those that leave a residue; fragrant products that feature oils are the most common culprits. Slips can also happen as a result of moisture from the weather being tracked inside, or even residues from asphalt parking lots, which catch oil, fluids and grease. “Any type of liquid that gets on the floor has the potential to cause a slip and fall,” says Spencer. 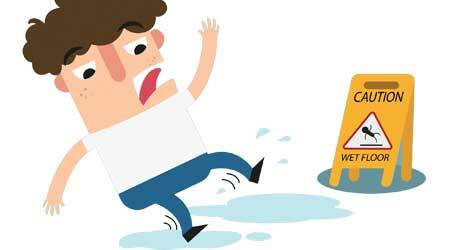 Statistics show that age is also a factor in increasing slip and fall accidents. According to the National Institute on Aging, every year, 30 percent of people over the age of 65 will sustain a fall, of which 10 percent will result in a serious injury. The custodial staff plays a huge role in making sure that the buildings they service are safe from slip and fall hazards. To reduce the slip and fall risk, he suggests using quality chemicals and mixing them correctly. Train staff to use proper methodology, including maintaining clean mop water and cleaning auto-scrubber brushes. Finally, and especially crucial, make sure staff is trained on safety measures. One hazard that is easy to identify is moisture tracked in from outside a facility. This cant always be controlled, but a strong matting program can contain it. The industry standard is to use mats that extend 10 feet, but between 20 and 30 feet is often recommended. “The longer the mat, the more moisture or soil you’re removing,” says Russ Kendzior, founder of the Southlake, Texas-based National Floor Safety Institute (NFSI) and secretary of the ANSI B101 Committee. Mats should be of high quality, kept clean and dry and should be changed out regularly. These mats should be shampooed monthly and vacuumed three to four times per day, says Poole. They should also be properly maintained so that they don’t buckle or fray.